Think BIG – words to live by, and we make it happen. 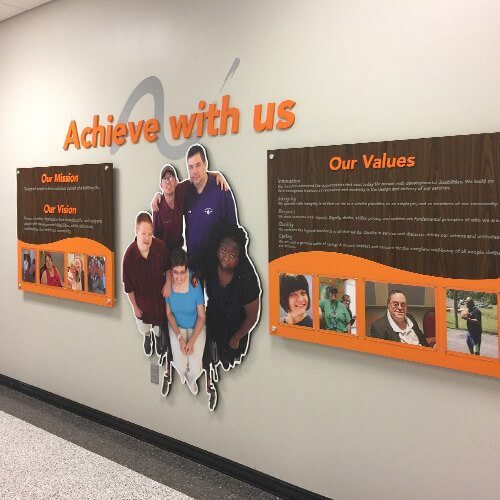 From 100′ outdoor banners to point of purchase displays for national retailers, Kohn produces a wide variety of large format printing right here in our shop. 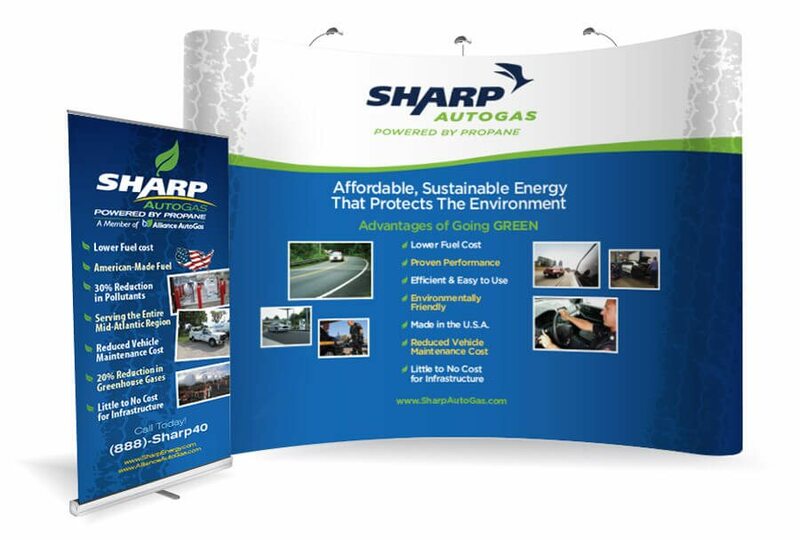 Need a custom trade show display to set you apart from 250 other vendors? Yes, we can do that too! 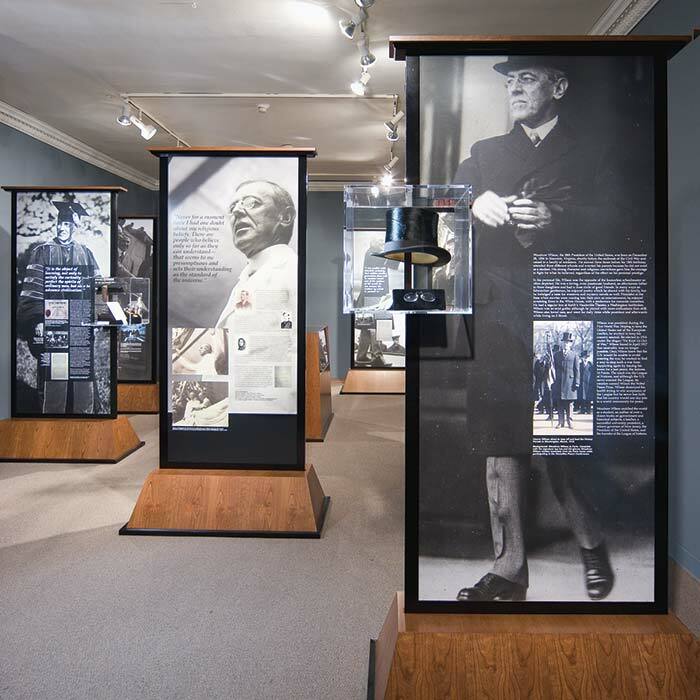 Displays, Signage, and Exhibits, and More! Between our digital roll printer and flat bed printer, we can create signs, banners, posters, prints on acrylic, and more! The power of digital roll printing and contour cutting combined for incredible customization. Whether it's a donor display, a museum exhibit, or a tradeshow display, our quality and design will make you a stand-out. 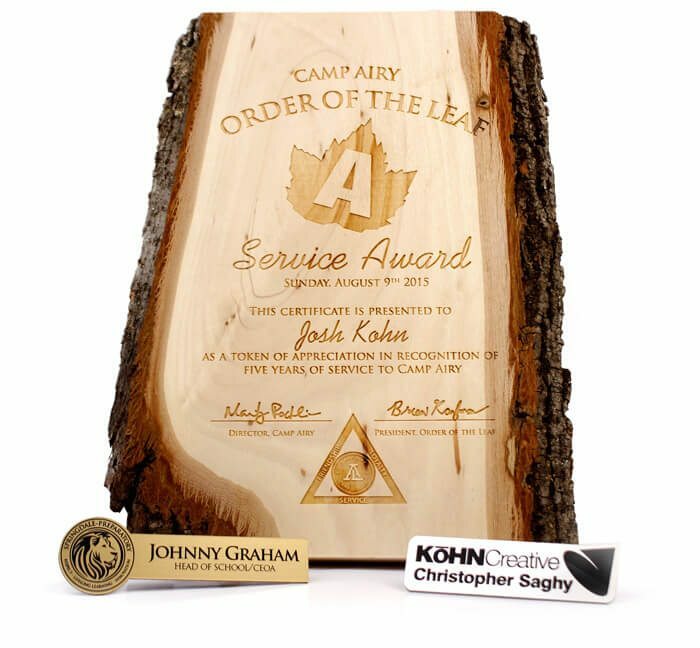 Laser cutting and extremely detailed etching bring you custom awards, name badges, give aways, and more! 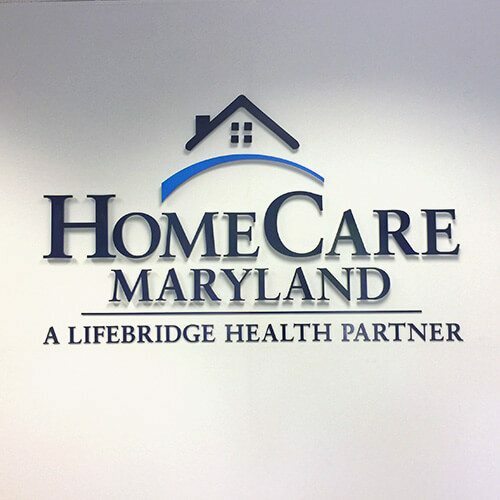 When you need signs, oversized prints, posters and banners, we are here to help. Big Prints with Big Impact. Need a banner or large poster? We can print full-color at 1400dpi resolution. This printer can reach up to 63 inches in width (depending on material), and since we are using roll material, the length is virtually unrestricted. We are always experimenting and expanding our material capabilities, so if you don’t see what you are looking for, contact us and we will try to accommodate you. Banners: We print our banners on vinyl reinforced with threads, so our banners are suitable for indoor or outdoor use. We also use an edge finishing process and metal grommets for durability you can count on. Posters: Posters are available on a range of different quality and finish papers, including canvas. One-way Window Graphics: Printed on perforated vinyl–so you can see out, but they can’t see in–graphics can by applied to windows & doors. 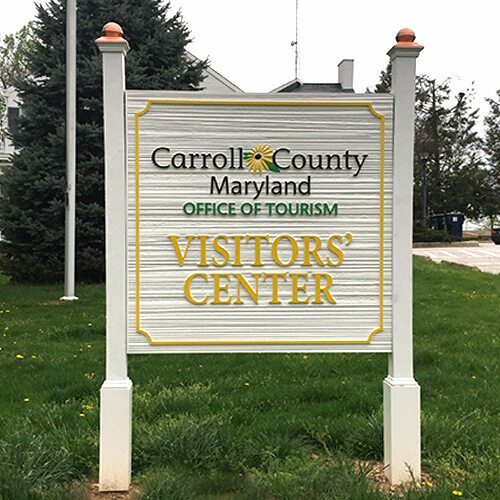 Static Clings: Static clings can be digitally printed on clear material, then custom cut to unique shapes. Transit Vinyl: Add your company’s logo as a decal on your vehicle. This adhesive will not damage your vehicle’s finish when it’s time to take the decal off. Sheet Magnets: There are many uses for sheet magnets. They provide a good alternative to transit vinyl for employees using personal vehicles at job sites. From campaign signs to life size photographic prints, we have a wide range of capabilities. This ink is essentially cured plastic, so it’s great for outdoor applications! 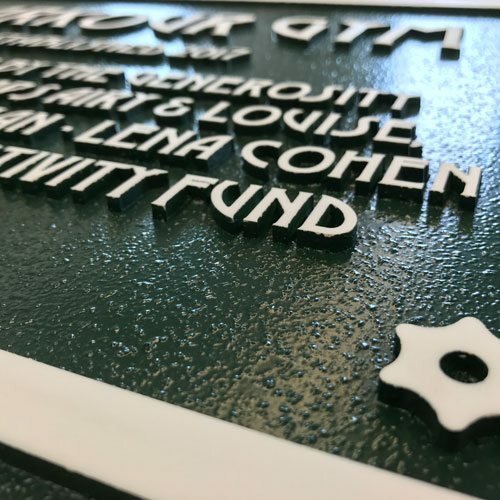 Our large flat-bed printer allows us to produce foam-core and plastic-core signs, print on aluminum, wood, and other hard flat materials–Virtually any flat substrate that is under 2 inches thick. At 1440 dots per inch, our machine can produce museum quality prints! Our unique machine can also print with white ink, allowing us to create interesting effects on clear and colored materials. We have tons of surprising samples at our office, stop by and see what we can do! 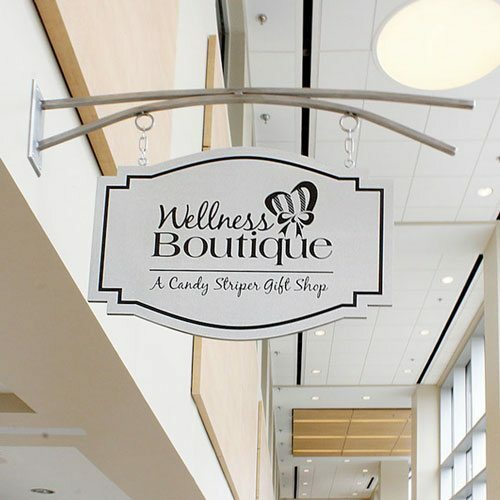 Signs can be printed on custom cut shapes too… Think outside the box! With a full wood/metal shop in our office, we have the power to conceive and create exhibits, donor displays, signage, and more. We love the chance to do something really creative in our fabrication shop. 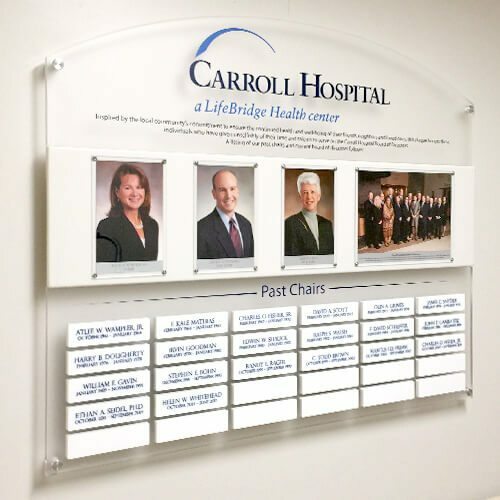 We often fabricate plaques, donor displays, complex signs, and exhibit components, but also can do unique projects such as promotional props. Laser cutters can cut and etch a variety of interesting materials from wood to plastics. 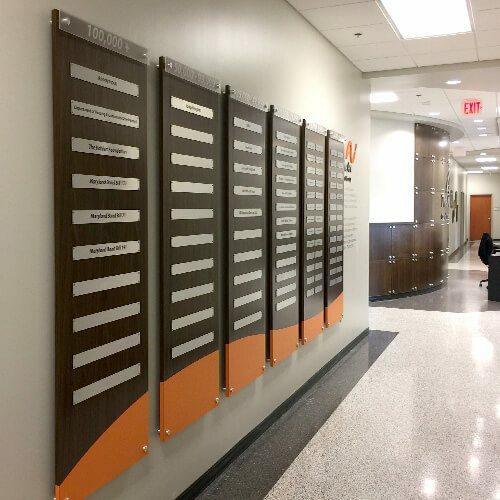 We are experienced in designing custom solutions for permanent donor walls, and continually changing and updating donor walls. We know how important it is to get the details right when donors are involved. 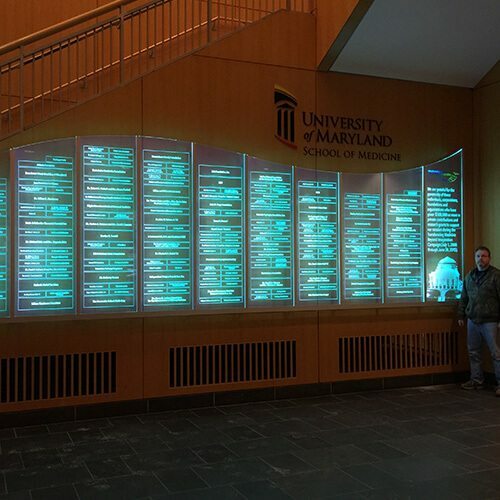 We have many different methods for updatable donor walls, and some unique ideas for fixed donor walls. 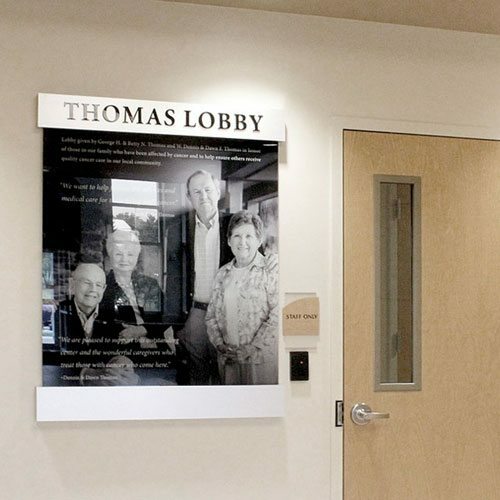 Done right, donor walls add visual appeal to your lobby, conference room, or corridor. 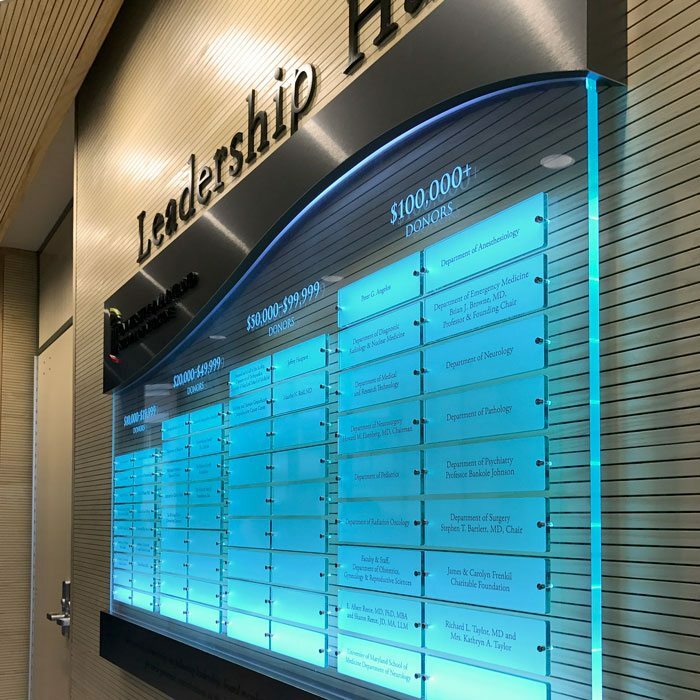 For indoor and outdoor applications, cut vinyl is a durable, attractive option. Our large vinyl cutter can be used in tandem with our roll printer to contour cut unique shapes around full-color prints. We also use it to create cut lettering for windows. We even offer an elegant frosted lettering that looks just like etched glass! Need help with removal or installation? Yes, we can do that too!